On this day in sports history, Pete Rose plays in record 3,309th game, surpassing Carl Yastrzemski. 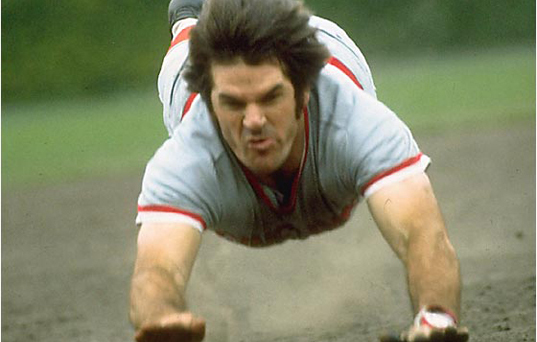 Pete Rose exemplified how baseball should be played, and he has Hall of Fame statistics. Let the debate begin again about why he is not in the Hall of Fame. Pete Rose put nothing in his body to enhance his ability to play the game, nor did he cork a bat that I know of, yet he is banned from baseball. Is it because of the Black Sox scandal that baseball is so sensitive to the gambling issue? If you don't know about the Pete Rose story I encourage you to find the history and arguments on both sides. I found this interesting perspective from +ESPN .com. Whatever you think is okay, because you will probably find folks in agreement with you. I am simply asking the questions. Besides, you can't deflate a baseball.